Been diving in North Tip Reef? Please Vote! North Tip Reef, off tiny Pom Pom Island is heaven for me. We drop in off the TRACC (Tropical Research and Conservation Centre) boat at about 8m and swim hard against a southerly current with 20m vis until we hit the north end of a wall. The drop-off bottoms out at around 50m, where a Giant Grouper lurks in the depths. The current means a lot of fish activity today. We hang in the flow, watching Trevally, Jacks and Yellowtail Fusiliers speed in exhilarating arcs, around and over the crest of the wall, feeding on baitfish and plankton. I try to spot Pygmy Sea Horses on some of the many impressive Gorgonian fans and deep green Tubastrea hard corals, but no luck this time. Suddenly there’s a yell from my Buddy – a sound that can mean only two things – either he’s spotted a Whaleshark, unlikely in these waters, or there’s a Blue Ring in town! And it’s the latter – we hang out with this gorgeous creature until impending deco demands we head for shallower water. To top it all off, we’re joined by 5 Green Sea Turtles on our safety stop. No one can stop grinning as we clamber happily back into the boat. 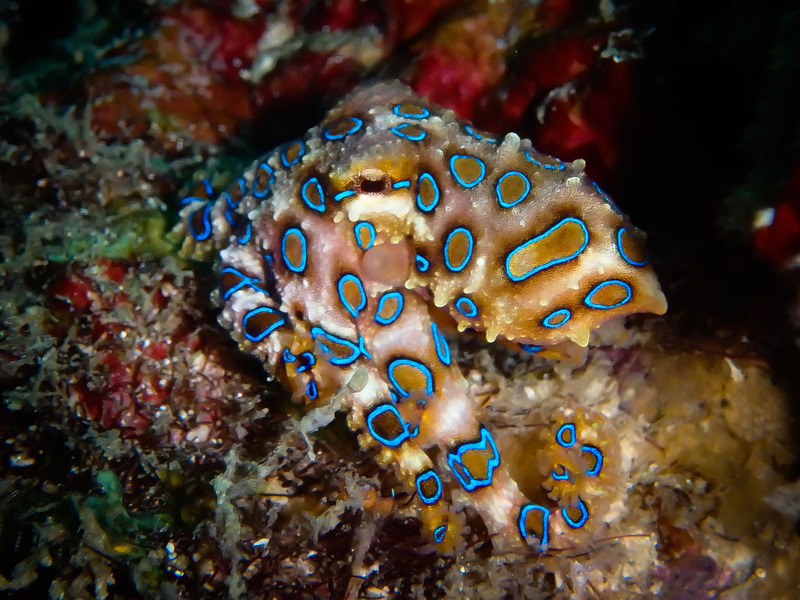 The Author: Elizabeth Fitt is a Divemaster and and photojournalist travelling to the Celebes Sea. Access: Short boat ride from Pom Pom island resort, TRACC or Celebes Scuba Resort. Map of Pom Pom Island, North Tip Reef dive site.